On March 14 my buddy David gave me two colonies of Tetramorium Caespitum (pavement ants). They are tiny little ants, but very interesting. Today my first Nucleus arrived from Tarheel Ants. I'm so excited it's finally here! I set one of the tubes of these T. Caespitum inside the outworld and put the lid back on it to allow them to move in at their leisure. I used a cotton ball to block half the nest (Macks great advice) to keep them from using the entire nest until the colony is bigger. This colony will be referred to as Nucleus 1 from now on. Edited by BugFinder, April 6 2015 - 7:18 PM. If you ain't got a dream, you ain't got nothing. As you can see from the photo above, I put their tube into the outworld of the Nucleus. Then I covered the nest with a towel to make it dark down there and put them under the bright lights in my kitchen. A couple of them have explored the nest, many of them have explored the outworld, but as expected they are holding tight in the tube, which is fine because I have no need to rush them. I'm going to let them move in as they wish. No need to rush them, I'm just going to watch. BTW: My initial thoughts are I love love love that nucleus, so glad I bought it. Planning to buy another just like it for my T. Caespitum #2. I'm hoping to spread my Pogonomyrmex colonies out, having one in a nucleus, one in a hybird by Ants Canada, and one in whatever nest byformica is currently developing. I haven't yet decided what to do with my D. Bicolor colonies. I guess that depend on which nest I like best after trying them all out on my Pogonomyrmex. Edited by BugFinder, April 6 2015 - 10:33 PM. I just received my first Nucleus formicarium today as well! By far the best ant keeping product I have ever had. My only advice would be to shorten the tube you have connecting the outworld and the nest for aesthetic purposes. Edited by Miles, April 6 2015 - 7:49 PM. Hi, I'm Miles! I study ants, environmental science, political science, and science communication at Montana State University in Bozeman. I've been keeping ants for nearly a decade and I'm passionate about conservation and public service. I may do that. Thanks for the advice. Would you post photos of yours? What color did you get? I didn't think I'd like this yellow color but as it turns out, I do like it alot. Edited by BugFinder, April 6 2015 - 7:34 PM. I will definitely post photos and an objective review of mine. I went with the terra-cotta option. I like the color you chose quite a bit. I've got to say, both of them look pretty darn good! You have two colonies, and one goes into the Nucleus- what happens to the other? This species does fine in just simple test tubes so do not worry about the second colony not having a formicarium. All of my Tetramorium colonies failed in test tubes, while those put in formicariums survived. Just a thought. 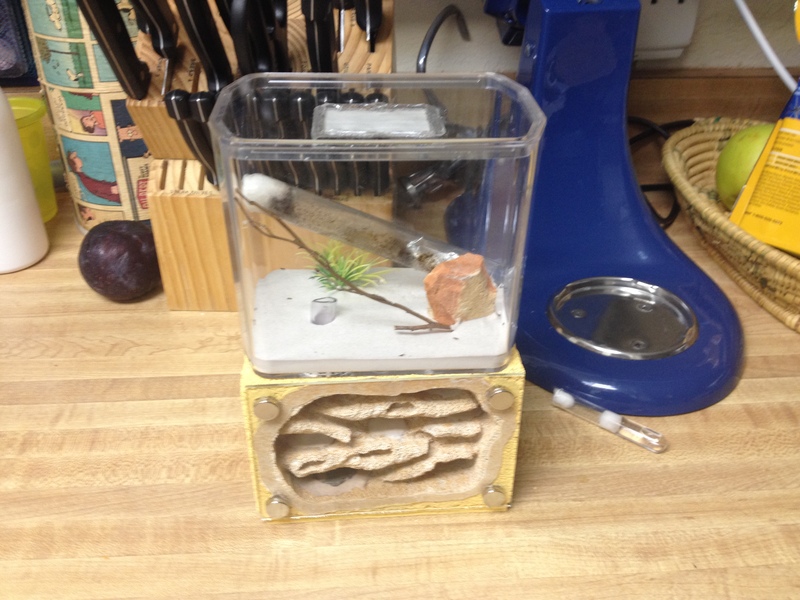 The other colony is still in their test tube until I can obtain another formicarium for them. Mine is living in two test tubes, and are over two hundred workers now. What were the circumstances to your colonies dying besides test tubes, because mine are doing great. It seems to be a huge matter of luck with test tubes. I have raised successful colonies in them, but very few. The test tubes varied. In some, it was a standard setup, in others, an outworld was connected. I actually tried a number of variables, and by majority they failed after ~20 workers. Those that survived were the colonies that were moved into a formicarium. Let's not hijack BugFinder's thread. Edited by Miles, April 6 2015 - 8:35 PM. How do you feed them without having a million (more like 20) run out? that's been difficult, and fun to try. lol. I have not been very successful at it. What do these little buggers prefer to eat? 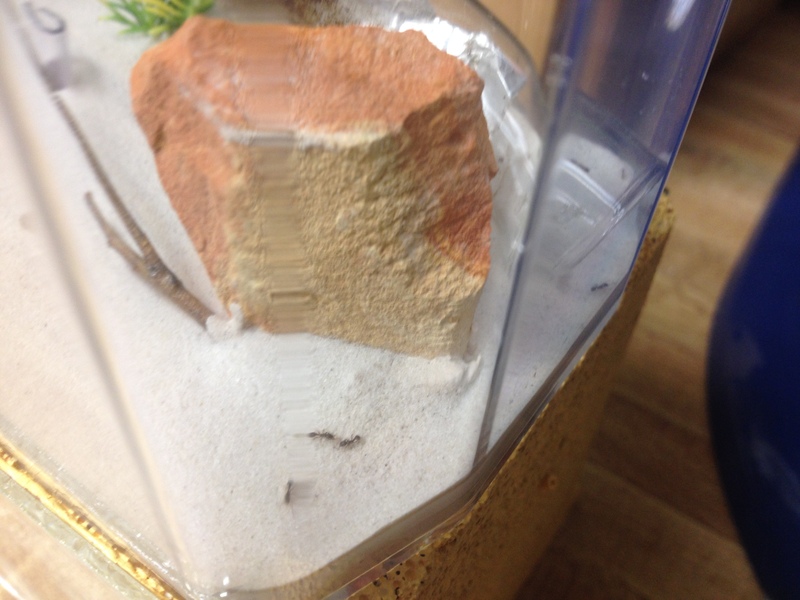 They love byFormica Blue 100, crickets, other insects, just about anything. They do not seem to be picky at all. Edited by Gregory2455, April 6 2015 - 11:15 PM. That's why I love them there're so easy to take care of. Mine love fruit flies, mealworms, THA ant juice, and apples. Nice colony! THA makes amazing looking formicariums. How many workers are there? I've never tried Fluon in a test tube before, but it does sound like something that could work.